Kapa Biosystems is a leading biotechnology company in the greater Boston area that specializes in next generation sequencing. Recently they have been acquired by Roche Technologies, one of the largest biotech companies in the world. As a leader in the space, they are constantly innovating in new industries and creating new products. 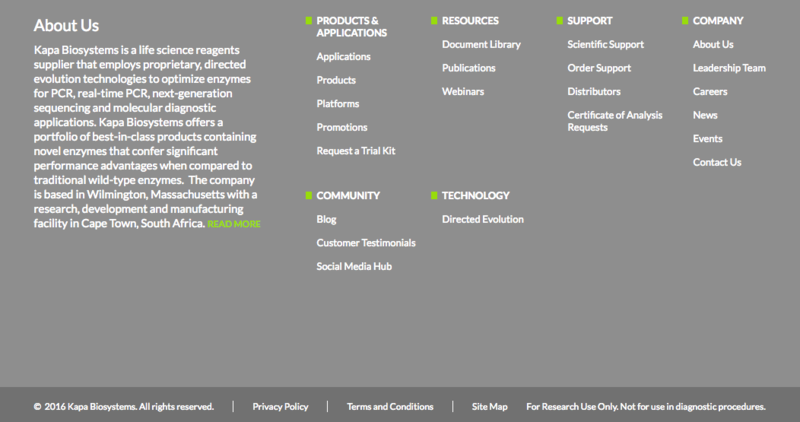 Kapa Biosystems needed someone to take over their website and move it to a more stable hosting situation. They needed someone that could handle the complexity of their website and help it grow on a visual and functionality standpoint. They also needed to stand up new sites for different countries they will be selling to.